Many of us follow huge numbers of people and it is impossible to read every single tweet. However, there are some people that you want to be sure you read every single tweet. I have a short list of users like @ligonier @desiringgod @theResurgence @ThomRainer and @albertmohler which I like to be sure to catch everything they say. Seesmic Desktop’s killer feature is userlists which allows you to group your friends into specific lists and review the tweets of that userlist. This will make sure your family’s tweets, your best friends’ tweets, or your favorite pastor’s tweets do not get buried. The userlist feature alone keeps me using Seesmic, but there are a few more nice features. Seesmic Desktop includes easy link shortening with services like bit.ly and picture sharing using twitpic. When sharing a picture you can drag and drop a picture from your computer, browse for a picture, or even snap a picture with a webcam. 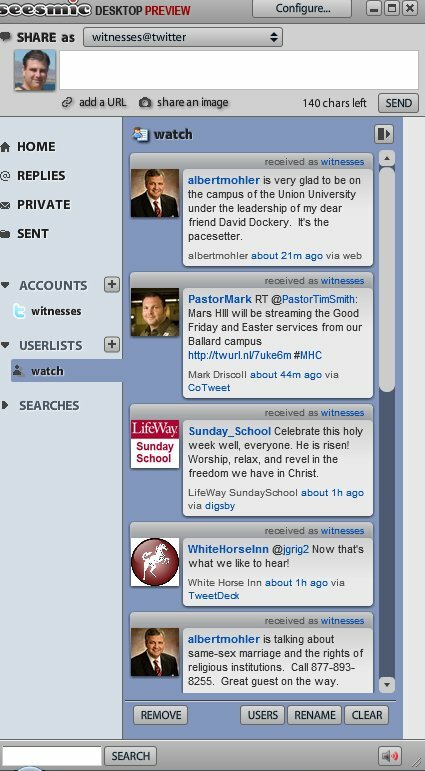 Saved searches are also nice, so if you want to keep on eye on tweets with #baptist in them, you can keep it as a saved search. I see some great potential, and I am going to continue using Seesmic Desktop for the time being. However, it is a very early preview release and the bugs affirm this. It seems some right click options are being planned, but for now there is a series of “null” options. I can only use the software maximized and cannot resize the window, although I could when I first started using it. I cannot seem to find how to follow or unfollow people from the client either. To work around this, I simply double click the user which launches my web browser and opens the persons profile and I follow/unfollow there. Good work Seesmic, I hope to see new versions coming soon. Previous post: Should pastors tweet? Next post: Did Jesus go to Hell?